A DUPE FOR TARTE'S SHAPE TAPE CONCEALER? In my Best of Beauty 2017 post I included a lot of makeup products that I absolutely loved in 2017; but one product that stood out and I have continuously used for the last four months is the Tarte Shape Tape concealer. I never thought that there would be a concealer that would come anywhere close to Tarte's concealer, but I may have been proven wrong. 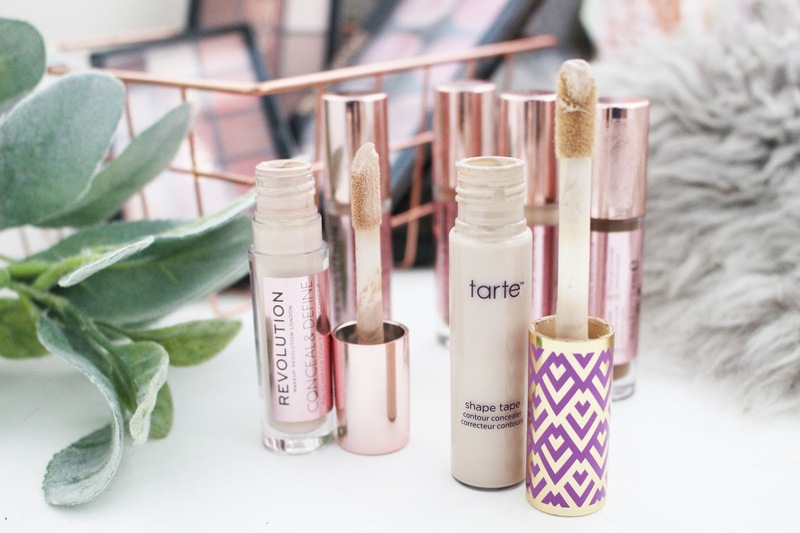 The Tarte concealer is my holy grail concealer, but when I saw that Makeup Revolution had brought out a new concealer called the Conceal & Define, I was very excited because it looks identical to Tarte's Shape Tape and is a fraction of the price. 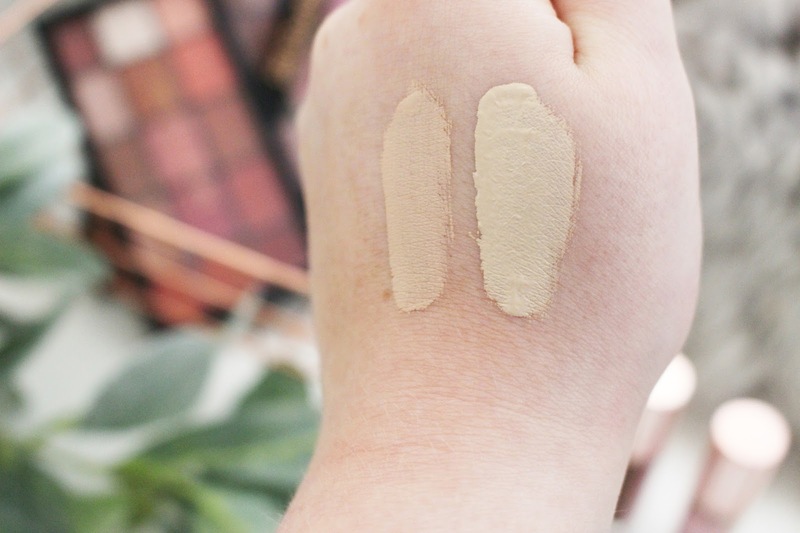 You will have probably seen this concealer in so many beauty blog posts and included in many YouTube reviews and tutorials, as this concealer has taken the beauty community by storm and has become a new favourite for many! 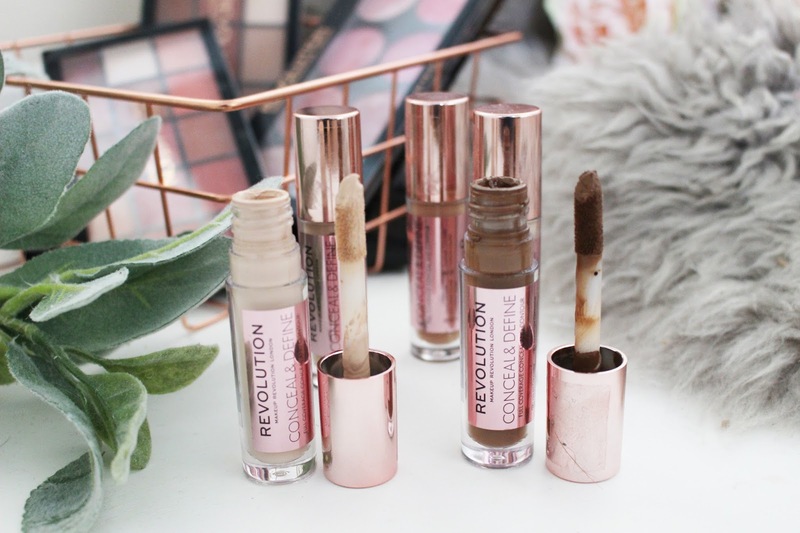 Makeup Revolution is not a brand that I have really spoken about, in depth, on this blog - even though I have used this brand since I started this blog in 2015. I really love this brand and they are so affordable, plus they often have dupes for high-end products (in some cases they are even better than the original). Of course, there are some products that I am not a massive fan of but there are a lot of products that I love and use frequently. Like I said, Makeup Revolution is a brand that is so affordable (with an eyeshadow palette costing between £4 and £12). If you are in the UK, you can buy the range from Superdrug or TAM Beauty and if you are in the US you can buy some Makeup Revolution products from ULTA. Earlier this year, Makeup Revolution launched their new Conceal & Define range; with 18 shades to choose from. Not only have they considered a wide variety of skin tones (although they can definitely add more shades in the future) but they have also made sure to pay attention to different undertones. 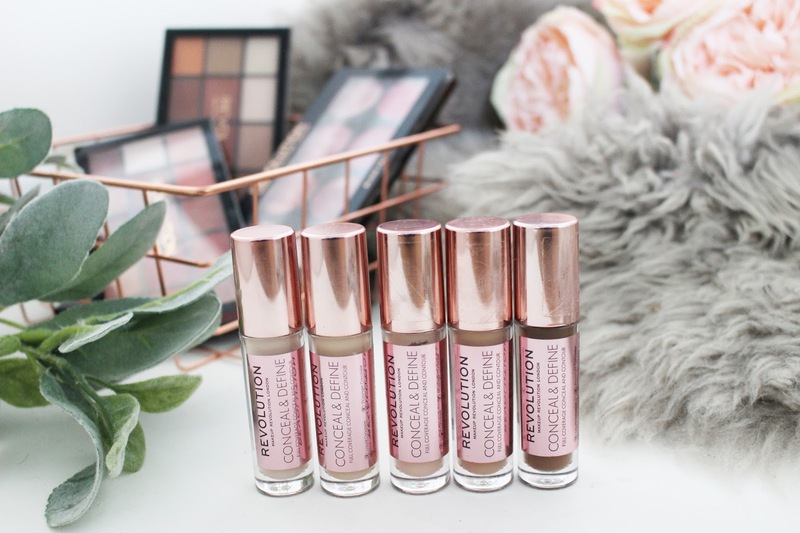 As soon as I watched and read some reviews on these concealers, I went straight to my local Superdrug store and purchased some of the shades, however they didn't have every shade in stock so I also purchased a couple of shades online. They were almost sold out in my local Superdrug so it might be easier to order online - but I would recommend going into a store and swatching the tester first as the shades don't necessarily go from the fairest shade to the deepest (because of the different undertones). I did purchase five shades from this collection because I also wanted to use these as cream contour products as well as to conceal and brighten. 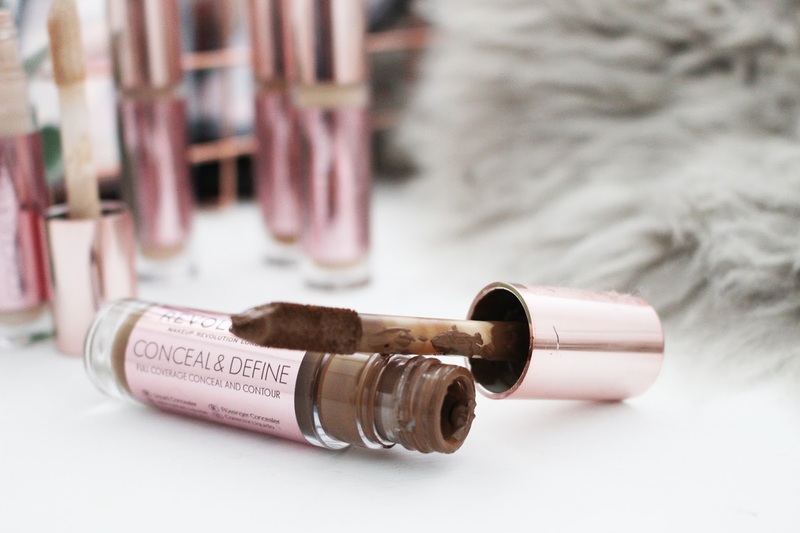 The Conceal & Define concealers retail for £4 from Superdrug and TAM Beauty and $7 from ULTA. The Conceal & Define concealer is lightweight, yet offers full coverage in order to cover blemishes, conceal dark circles and evens out your skin tone. Makeup Revolution has stated that this has more of a matte finish that doesn't settle into fine lines and doesn't accentuate any lines or texture on the skin. It is also described as being a long wearing concealer that offers and opaque finish which can also be used as a cream contour product to help define cheekbones. The tube is quite small with it only being 3.4ml, although it does look beautiful with the rose gold packaging, and it has a large doe foot applicator - which does sound very similar to Tarte's Shape Tape concealer ... right? Basically this has been called a dupe for the Shape Tape concealer by so many Bloggers and YouTubers and I am excited to see if that is truly the case. 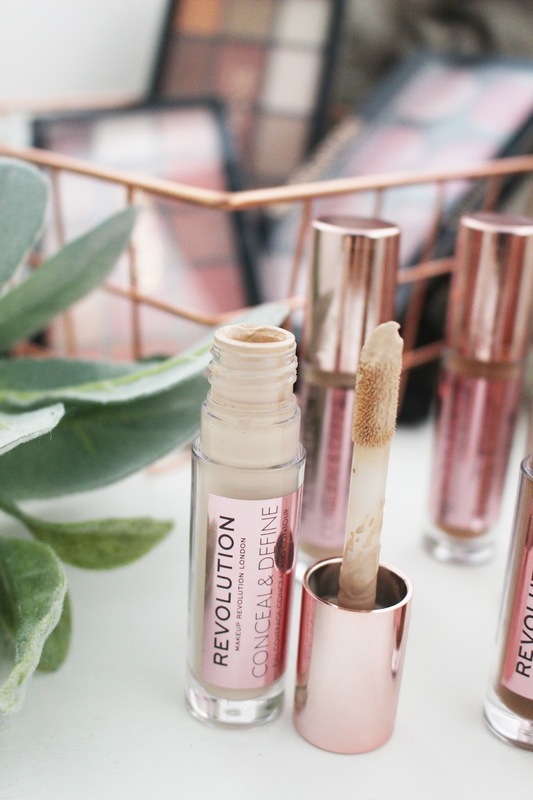 One of the best things about this concealer from Makeup Revolution is that this only costs £4, whereas Tarte charge £22 for their amazing concealer! I have tried a concealer palette from Makeup Revolution before and I wasn't that impressed - the concealers were quite greasy and it gave me no coverage. So, I did think that these concealers would not be up to much because I have had some misses with this brand in the past. But after hearing so many amazing reviews on this product I thought I needed to try it and see if it really is a dupe for the Tarte Shape Tape concealer. There are 18 shades ranging from fair to deep skin tones with cool, neutral and warm undertones. What I will say about the shade selection is that there is a huge jump from fair to deep, so I definitely think that there can be more shades added to the range, but for their first release the shade selection is pretty impressive (especially as some drugstore brands only have four shades of concealer in their collection). Also, it is best to swatch the shades first as the shade selection doesn't always necessarily go from fair to deep. 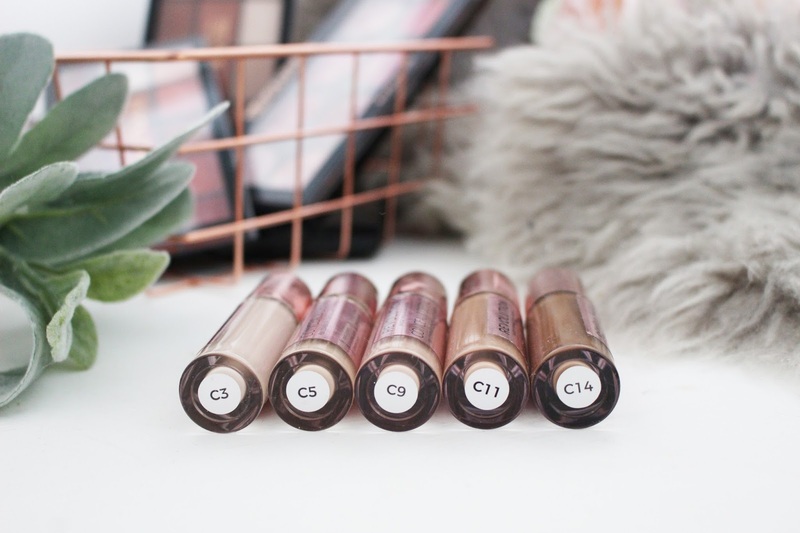 I found that C5 and C9 are very similar in colour but have different undertones to them, so that is something to consider when finding the shade that is perfect for you. 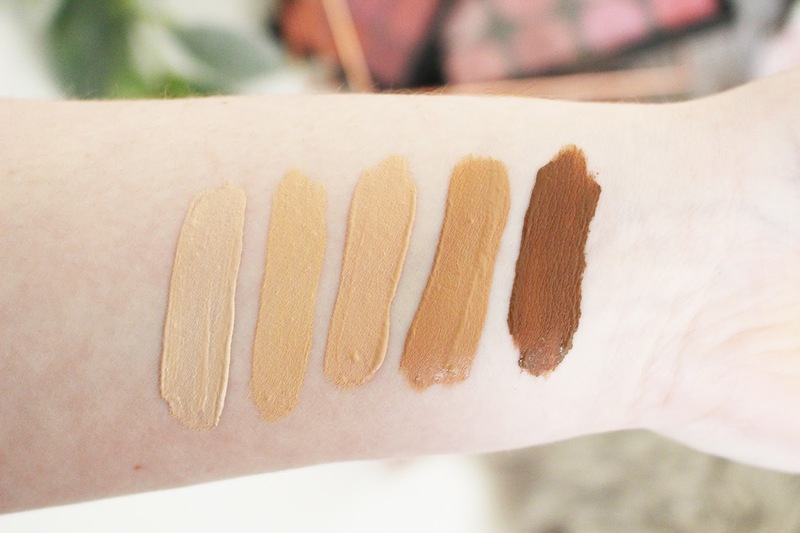 I purchased five shades (both in store and online) as I want to use these as cream contours and I wanted some medium shades for when I am tanned in the Summer. C3 (for fair skin tones with pink undertones) - this is to help brighten my under eyes and to highlight certain areas of my face. This is a couple of shades lighter than my foundation shade so is perfect for brightening and highlighting my face naturally. C5 (for light skin tones with pink undertones) - this shade matches my skin tones perfectly, so is great for covering blemishes as well as being able to use it as a foundation on days when I don't want to apply a heavy foundation. C9 (for medium skin tones with peach undertones) - I love this shade for when I am slightly more tanned in the Summer as well as using for a more natural, light contour when I am fairer in the Winter. C11 (for medium/deep skin tones with beige undertones) - this is the shade that I have been using as a cream bronzer contour as it has a slight warm undertone that makes it perfect for when I am fairer in the Winter and Summer to give me a bronzed makeup look. C14 (for deep skin tones with a cool undertone) - this is my cream contour shade as it has a cool undertone, although I only use a small amount as it is quite a deep shade. So, now lets talk about my first impressions of the product and whether I think this is a dupe for the Tarte Shape Tape concealer. I have been using these concealers for the last three weeks and I can say that I am very impressed with it. This concealer is amazing and it only costs £4 (that is even cheaper than the Collection Lasting Perfection concealer). I believe that this is the best concealer ever made ... well done Makeup Revolution! Since buying this concealer, I have not touched my Tarte Shape Tape. Although I will always go back to Tarte when I want my makeup to look flawless for photos or for a special occasion. However, this concealer from Makeup Revolution is just as amazing and makes my skin look just as good every time I wear it. This concealer ticks every box; it does not feel heavy on the skin, it doesn't look cakey, it gives full coverage, it covers every little blemish and redness and it lasts all day without needing to be touched up. Sometimes, concealers can settle into fine lines under the eyes but this concealer does not do that and my skin looks so smooth and flawless whenever I use it. I have also found that I don't have to bake my concealer when I use this one as it sets itself when it dries fully - although I do always brush some powder over the top. I did think that this concealer might not work for anyone with dry skin as it does dry down fully matte, but this concealer did not cling to any dry areas on my face and it actually did give a slight radiant glow to my face. I really love how creamy this concealer is and it is so easy to blend out, especially with a damp BeautyBlender. It also works amazingly as a cream contour shade as it blends out and looks really natural, whilst giving a radiant bronzed and contoured look. I love this as a concealer, but I have used the shade C5 as a foundation and it is amazing (however, I wouldn't recommend it as a foundation as you will go through the small tube of concealer very quickly, so hopefully they bring out a foundation soon). This is identical to my Tarte Shape Tape and it gives me the same result. All I will say is that the Makeup Revolution concealer dries a lot quicker than my Tarte Shape Tape - so when using this concealer I would recommend doing your face in sections as it does dry down very fast and you don't want to ruin your makeup. If it has dried down then I just used a damp BeautyBlender and that helped to blend it out, but I found it easier to just do my concealer in sections especially if you are taking your time to get your makeup just right. This does come with a large doe foot applicator (which is very similar to Tarte's Shape Tape) which makes it so easy to apply a thick layer of concealer. I do prefer larger applicators as I can get my makeup done a lot quicker and I find it easier to apply my concealer with that kind of concealer. You also don't have to keep going back to get more product with the concealer as the applicator is so large. I also didn't have to build up the coverage especially when it came to using the deeper shades. Often with cream contour products they can blend into nothing and just vanish, but that is not the case with this concealer. One swipe of the applicator is enough and it blends into a beautiful, natural contour that just gives a healthy glow to the skin. The result of this concealer is the exact same as Tarte Shape Tape - I have even tried Makeup Revolution on one half of my face and the other half with the Tarte Shape Tape and I could not see much of a difference. The only real difference is the consistency and the formula. I do find that my Tarte Shape Tape is more creamy and hydrating so is perfect for drier skin as it doesn't dry down so fast and it doesn't seem to dry fully matte on me, so I still get a youthful and glowing result. Whereas, with the Makeup Revolution concealer, I have to make sure that I have moisturised first and really hydrated my skin as it can sometimes look a bit dry if I have not moisturised first. Although I do think it looked a bit more dry because I tried to do my whole face with the concealer, rather than splitting it up into sections so that the concealer didn't dry down fully, as that was one of the times that I did struggle to blend it out. The longevity of this concealer is out of this world - I can wear this from 9am to 9pm and there is no creasing, fading or any little blotches from where the concealer has come off. Often concealers will crease around my nose (where I am particularly dry) but this concealer does not do this and I am so impressed with it. I have also read reviews where they have said that this concealer is perfect for anyone with oily skin as it does not fade, although it is best to powder over the top first to make it last even longer. I just wish the tube was slightly bigger. That is my only criticism of this product - I have already had to repurchase one shade (although I did try it as a foundation) but I can see that a lot of the tubes are getting a bit empty as I can see streaks on the tube. However, these only cost £4 each and I would rather spend that than £22 every month for my Tarte Shape Tape. I managed to get four of these Makeup Revolution concealers for the price of one from Tarte! If you love the Tarte Shape Tape Concealer, I would 100% recommend this concealer from Makeup Revolution as it is an exact dupe and a fraction of the cost. This did not break me out and it does seem to be working really well with my skin at the moment. I am still going to use other concealers as that is what I do for this blog and I don't want my skin to become too used to one product but this is definitely one of my new holy grail concealers (although I do love Tarte Shape Tape as well and that is perfect for when I am at my palest because the shade fair is a lot paler) and it only costs £4. I really do hope that Makeup Revolution come out with a matching foundation as they are absolutely killing it in the drugstore beauty brands! Let me know in the comments if you have managed to get your hands on these concealer and what your opinions of them are? Also let me know if there are any other Makeup Revolution products that you would recommend or want to see me test out on this blog! THERE'S A NEW TROUBLEMAKER IN MY COLLECTION?